My singing history is very long, so I’m just going to touch on my recent success. About a year ago I auditioned for Ohio State Newark’s Got Talent where I placed second. After that performance, fellow students Elizabeth Beatty, Melissa Tobin and Hunter Spittler and Assistant Director for Student Life Justin Khol told me about Karaoke Night, so I started to going. I don’t think I’ve missed a karaoke night since. 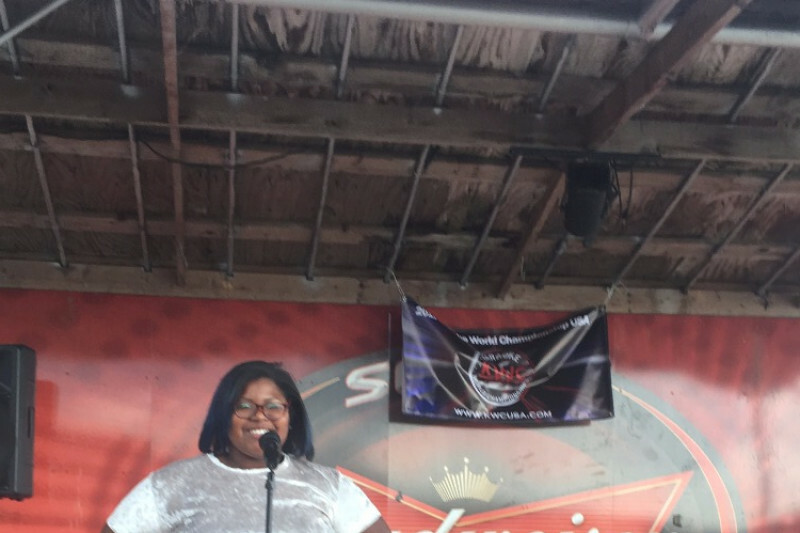 This past spring the karaoke night event holders Tim and Vickie Craft asked me if I wanted to compete in karaoke. I told them I usually go home for the summer and that I wouldn’t be back until school started again. They said they would take my information and contact me when it was starting up. I came back and I went to the qualifying round, where I qualified and was the female winner for the first round. We were supposed to have a semi-final round but that round was eliminated and I immediately became a finalist. Finals were held at Woody’s Pub and Grill in Buckeye Lake, Ohio. We went two rounds; my first song was ‘Georgia On My Mind’ and my second was ‘And I am Telling You’ by Jennifer Hudson. The second was a little difficult because the arrangement was slightly different than what I had been practicing so I got stuck in the beginning of the song and the judges penalized me for it. I ended up getting second place still qualifying for Vegas; but only the first place winner had their fares paid. A very generous anonymous giver believed in me so much they offered to pay for me and my boyfriend’s way to Las Vegas so I could compete. In Las Vegas, I will be representing the State of Ohio and in competition to win a prize of $1000 and a chance to represent the USA in Helsinki, Finland. ROUND 1 is Thursday September 28, and Friday September 29th. I will compete Thursday between 10 am and noon. I will compete Friday between 7:30 pm and 10:30pm. ROUND 2 is Saturday September 30th if I make it. I’m so honored to even be considered in this event and on this type of platform. I’m hoping to win, but if I don’t I am very happy to have had this opportunity to represent my state and schools. After this competition is over I’m looking forward to finishing my education strong and seeking more venues to perform at. I want to thank those who have pushed and believed in me. Thank you to Justin Khol and Vorley Taylor for always making a way for me to perform. Thank You to my voice coach Perry Meyer. You are the reason I am going to Vegas, without you this would be impossible. Thank you to Vickie and Tim Craft for having so much faith in me from the beginning. Thank you to my entire family and all my friends. I appreciate EVERYONE!! !